ජාත්‍යන්තර අධිකරණ මෙරට ස්ථාපිත කිරීමට ජිනීවා මානව හිමිකම් කොමිෂමේදී ආණ්ඩුව හෝ විදේශ කටයුතු ඇමැතිවරයා එකඟත්වය පළකර නැතැයි සභානායක, රාජ්‍ය ව්‍යවසාය කන්ද උඩරට උරුමයන් හා මහනුවර සංවර්ධන ඇමැති ලක්ෂ්මන් කිරිඇල්ල මහතා පාර්ලිමේන්තුවේදී ඊයේ (08) ප්‍රකාශ ක‍ළේය. රණවිරුවන් හෝ වෙනත් කිසිඳු පුද්ගලයකු ජාත්‍යන්තර අධිකරණයට ඉදිරිපත් කිරීමට ඉඩ නොතබන බවත් සභානායකවරයා සඳහන් කළේය. ජිනිවා මානව හිමිකම් කොමිෂම හමුවේ ගිවිසුම් ගත වනුයේ නඩු ඇසීමේ ක්‍රමය, සාක්ෂිකරුවන් කැඳවීමේ ක්‍රමය වැනි තාක්ෂණික කරුණු සඳහා පමණක් බවත් ඇමැතිවරයා සඳහන් කළේය. ජිනීවා මානව හිමිකම් කොමිෂම හමුවේ ගිවිසුම් ගතවන කරුණු පිළිබඳව කැබිනට් මණ්ඩලයේ සාකච්ඡා කර තිබේද නැද්ද සහ පාර්ලිමේන්තුව දැනුවත් කළේද යන්න සම්බන්ධයෙන් පාර්ලිමේන්තු මන්ත්‍රී දයාසිරි ජයසේකර මහතා මතුකළ ප්‍රශ්නයකට පිළිතුරු දෙමින් ඇමැතිවරයා මේ බව සඳහන් කළේය. අද ජිනීවා මානව හිමිකම් කොමිෂමට තවත් ගිවිසුමක් ආණ්ඩුව යම් සහයෝගයක් සහිතව ඉදිරිපත් කරන්නට බලාපොරොත්තු වෙනවාද? එහි අඩංගු කරුණු කාරණා මොනවාද යන්න සම්බන්ධයෙන් කැබිනට් මණ්ඩලය දැනුවත් කළාද? පාර්ලිමේන්තුව දැනුවත් කර තිබෙනවාද.පසුගිය කාලේ මේ විදිහට සහයෝගය දීලා කටයුතු කළාම අන්තිම‍ට සිදුවුණේ ජාත්‍යන්තර විනිසුරුවන් ගෙනැත් පරීක්ෂණ කරන තැනට පත් කිරීමයි. හොඳ අධිකරණ තිබෙනවා කියා විශ්වාස කරන වකවානුවක ජාත්‍යන්තර විනිසුරුවන් ගෙනත් පරීක්ෂණ කටයුතුවලට මැදිහත් කරගැනීමේ අවශ්‍යතාවක් තිබෙනවාද. අපගේ අධිකරණ පද්ධතිය ගැන විශ්වාසද.ඔක්තොම්බර් 26 වැනිදා ආණ්ඩුව මංකොල්ල කෑවා. ඊට පස්සේ අපි අධිකරණයට ගියා‍. මේ අය අධිකරණයට‍ත් අපහාස කළා. ව්‍යවස්ථාදායක සභාවටත් බනිනවා. දැන් අධිකරණය හොඳයිද. අපට අපගේ අධිකරණ පද්ධතිය ගැන සියයට සියයක් විශ්වාසයි. වැරදි පාරේ ගිය ආණ්ඩුව හරි පාරට‍ ගෙන එන වැඩපිළිවෙළක් තමයි ජනාධිපතිවරයා ගෙන ගියේ. 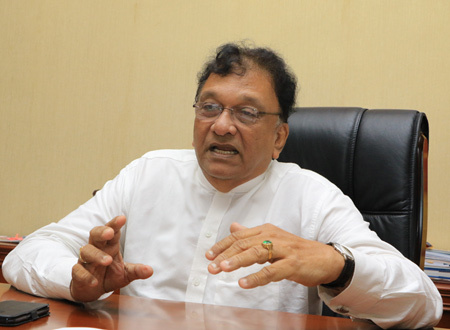 අධිකරණයේ , ශ්‍රේෂ්ඨාධිකරණයේ විනිසුරුවන් අපට විශ්වාසයි. එජනිස ආණ්ඩුව කාලයේදීයි අධිකරණය ගැන තැබූ විශ්වාසය නැතිවුණේ. අගවිනිසුරුවරිය පාර්ලිමේන්තුවට ගෙනල්ල පැය 24 ක් තුළ ධුරයෙන් ඉවත් කළා.එහෙම කරපු අය ජාත්‍යන්තරයට බනිනවා. එම තත්ත්වය 2015න් පසුව වෙනස් වුණා. 2012, 2013, 2014 වසරවලදී ශ්‍රී ලංකාවට විරුද්ධව ගෙනා යෝජනා සම්මත වුණා. ඒ ‍වගේම අපි බලයට පත් නොවුණානම් ශ්‍රී ලංකාවට එරෙහිව ආර්ථික සම්බාධක පනවනවා . අපේ ආණ්ඩුව ඒවා සමනය කළා. අපි ජාත්‍යන්තරය සමඟ සුහදව කටයුතු කරනවා. ඒ වගේම අපි පැහැදිලිව කියනවා. රණවිරුවන් අනෙකුත් අය සම්බන්ධයෙන් ජාත්‍යන්තර විනිසුරුවන්ට මැදිහත්වීම‍ට ඉඩ ‍දෙන්නේ නැහැ.රණවිරුවන් ගැන කතාකරන අය එදා සරත් ෆොන්සේකා මහතා කකුල් දෙකෙන් ඇදගෙන ගිහින් සිරගත කළා. අගවිනිසුරුවරිය ඉවත් කරනවාට අපි එදා විරුද්ධ වුණා. එ වගේම සරත් ෆොන්සේකා මහතා සිරගත කරනවාට විරුද්ධවත් අපි කතා කළා. ඒ මතය මම අදත් දරනවා. මංගල සමරවීර ඇමැතිවරයා හෝ ආණ්ඩුව ජාත්‍යන්තර අධිකරණයක් වෙනු‍වෙන් එකඟ වී නැහැ. ගිවිසුමේ කියා ති‍බෙන්නේ තාක්ෂණික කාරණා ගැන පමණයි. නඩු අහන ක්‍රම කැඳවීම වැනි තාක්ෂණික කා‍රණා පමණයි මේ තුළ ඇතුළත් වන්නේ. ජාත්‍යන්තරය සමඟ සහයෝගිව කටයුතු කර ලංකාවට හිතකර ලෙස මේ ප්‍රශ්නය විසඳා ගන්නවා. National reconciliation and foreign involvement! We have to learn a lot from South Africa and the leader Nelson Mandela. There were thousands of black killings and disappearance during white dominated supremacy in SA. When NM became to power he declared national reconciliation and asked his people to give pardon for those people who have brutal at that time. There was no UN resolution or human right in Geneva. Even the so called activist in SA just kept quiet. Our country had suffered 30 year because of this brutal war. Both side lost lives and properties and it was purely a negligence or inefficiency of our politicians who had not taken strong leadership to end the war. We are now enjoying a very peaceful environment in North and South. Like Sinhalese people settled their minds after the brutal suppression during the JVP activities in the south, we should ask our Tamil brothers and sisters to come in to a term that those brutal history would never help to reconcile our heart and mind. True we have to acknowledge the agony of those Tamil families having had because of disappearance of their love ones. Isn't' it the same for Sinhalese people who lost or disappear more than 60,000 youth during the suppression? So that as Champaka and Sirisena said we should forget the history and work together for the united nation in Sri Lanka. This is only the selfish politics in both side who trying to get more benefits for their survival. International involvement will deepen the problem than softening it. We have many living examples and we should learn from those examples. Long live my mother Lanka!